The venerable 28.04 metre motorsailer De Vrouwe Christina has been listed for sale by Andrew LeBuhn at Camper & Nicholsons International. Built by Dutch yard Feadship with a steel hull and teak superstructure to a design by De Voogt as the only hull from the yard inspired by the Dutch ‘Tjalk’ flat-bottomed barges, she was delivered in 1957 to an American owner. Extensive rebuilds and refits in 2002 and 2017 saw her receive a completely new hull and an updated, contemporary interior as well as state-of-the-art electronic and audio/visual systems. Her new interior now features varnished birds-eye maple wood panelling with custom detailing, accommodating six guests in three cabins comprising a full beam master suite aft and two twins forward. All cabins have entertainment centres, television screens and en suite shower facilities while the crew quarters sleep three staff aboard this yacht for sale. Her current owners have proven her capabilities by visiting the waters of Alaska, New England and South America in recent years while her shallow draft makes her ideal for exploring the more secluded bays and anchorages. Under power, twin 350hp Perkins diesel engines allow a cruising speed of 9 knots and a range of 1,000 nautical miles. 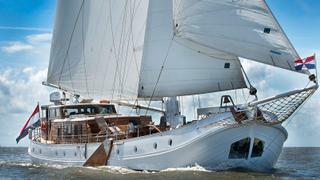 On display at the Palm Beach yacht show, DeVrouwe Christina is asking $3,450,000.